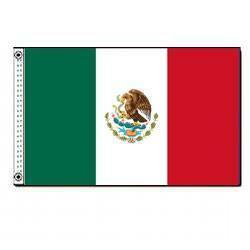 The current Mexican flag was adopted in 1968 although the overall design has been used since 1821. Red, white, and green, the colors of the national liberation army in Mexico, were adopted during the War of Independence. At the center of the flag is Mexico’s coat of arms: an eagle, snake in its talons, perched on a cactus atop a rock in the middle of a lake. The emblem stems from the Aztec legend that the gods told them to build their city where they saw an eagle eating a serpent on a cactus in a place that is now Mexico City.